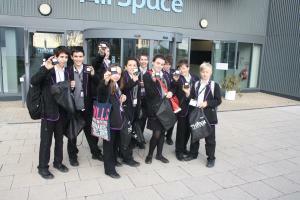 On Wednesday 7th of December, Miss Korn and Mr Moriaty took ten students to the Imperial War Museum, in Duxford. In the museum there was a one-day programme being run by Microsoft for children from selected schools, who were gifted and talented in ICT. The programme was about computer science and throughout the day there were many talks on subjects to do with computer science. For example, one was on gaming, and another on programming. During lunch there were demonstrations of new products by Microsoft. My personal favourite was the hovercraft, which was operated with a joystick, and was flown as if you were in the hovercraft, with a camera on the front of the hovercraft. There were many different talks and demonstrations, some of which were interesting or fun, and some of which were very hard to follow, but at the end of the day, the general feeling was it was a great day.